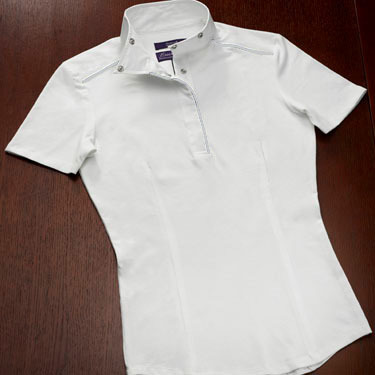 This innovative shirt keeps you cool and in style in the show ring. It features CoolMax knit material that is stretchy for comfort and ideal fit. Front and back seams provide support, while navy piping adds detail. The neat snap collar gives the appearance of a show shirt with traditional choker when wearing your jacket. Ideal for warm weather showing! 47.5% CoolMax, 47.5% Cotton, 5% Lycra material. Stretch knit for comfort and fit.